I like how the Character List has Cameron with a spray painted “Pryde” now. Nice touch! The Ruins of Centrum. The Great Mutant Haven. New York City. 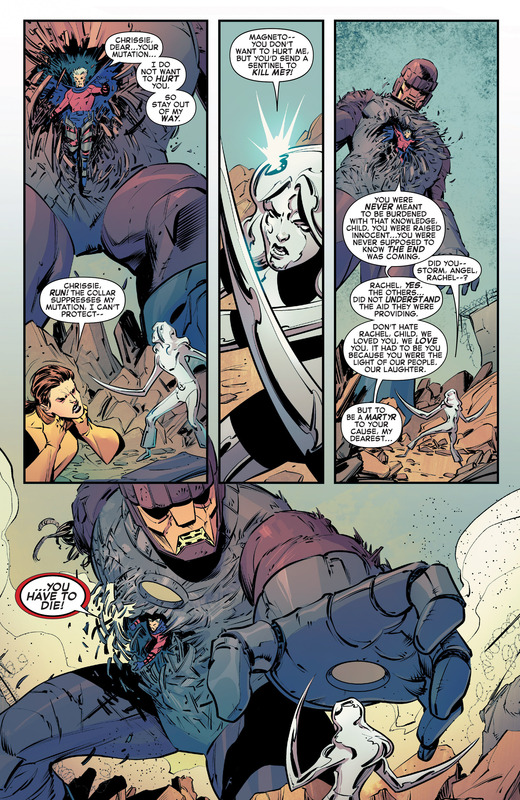 Storm and Rachel are assisting Wolverine, Angel, Colossus and Magneto. 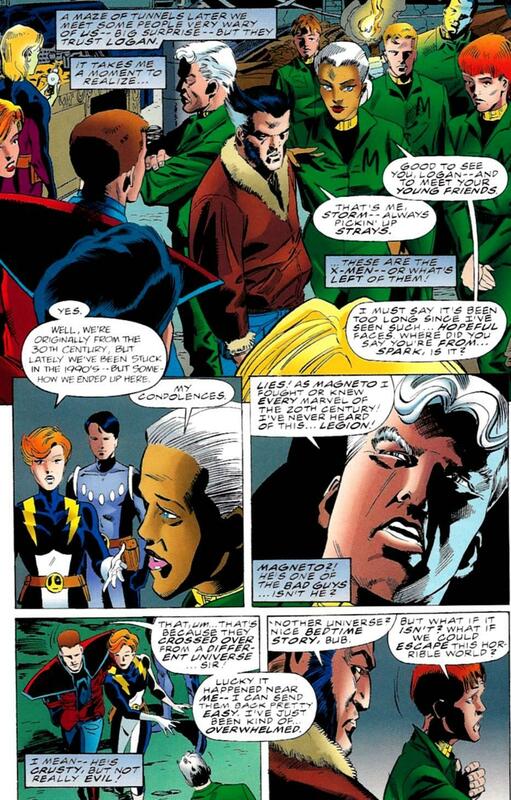 Magneto and Angel discuss how the endgame is near. No one mentions if they found Lockheed, or if he is alive. Hopefully we find out his fate, next issue. The Last Mutant Internment Camp. The Pryde offspring are trying to free the imprisoned mutants. Destiny starts wailing into Christina. She sets up Avalanche to kill Christina but Kate saves her daughter and Avalanche, rightfully, dies. Meanwhile, Cameron kills Pyro, but not until Pryo tells him about the compromise. 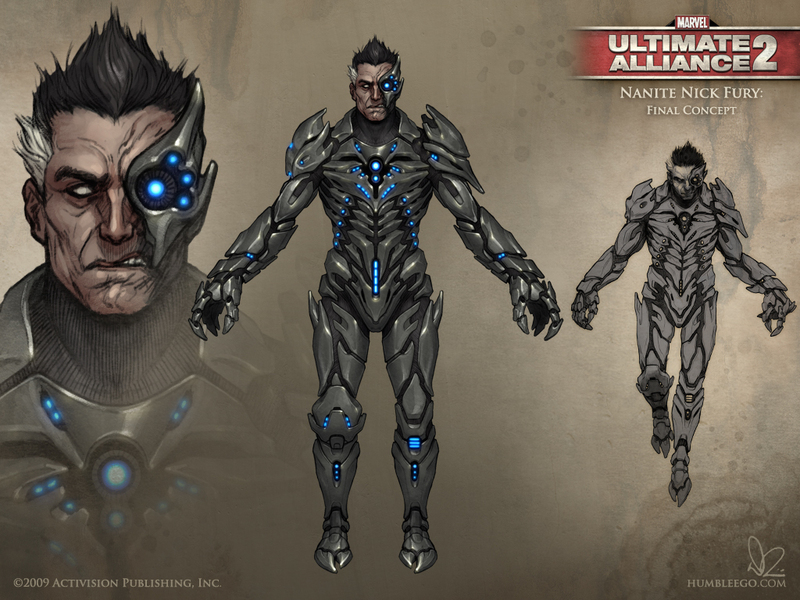 The Brotherhood of Mutants have been able to walk freely but they have been giving up their fellow mutants. Those poor unfortunate souls, have been tortured. I wouldn’t cry over Pyro’s death but now I really wouldn’t. Magneto arrives in the Sentinel that was in Centrum, but I thought it was only the head of a Sentinel. 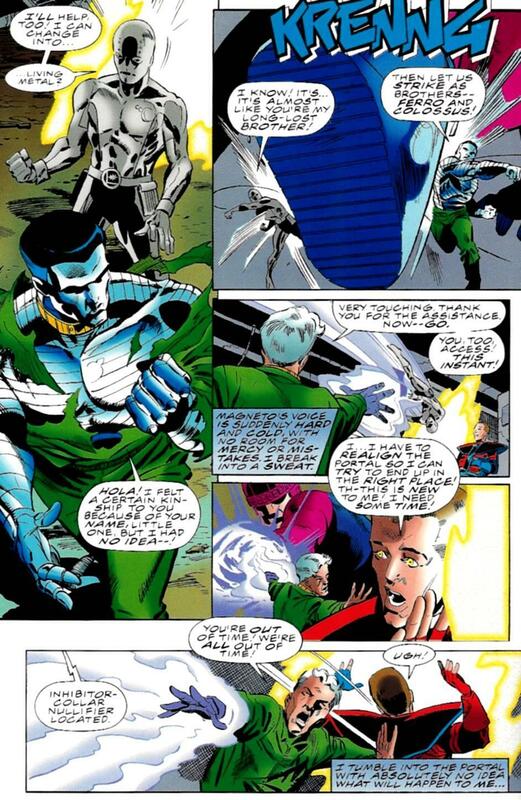 I imagine that, after fighting so many Sentinels – this evening – so that is easily explainable. 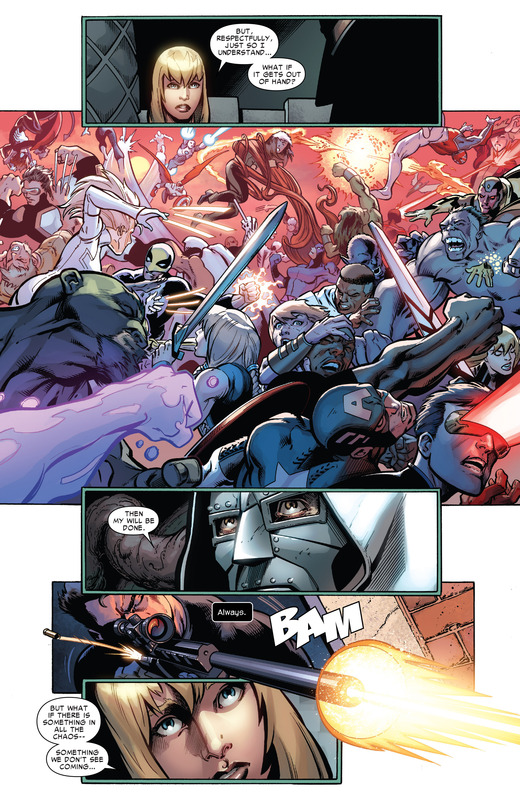 Magneto Sentinel starts punching the troops. I could have gone for a full page of Wolverine and Cameron’s exchange. Christina is happy to see her Uncle Erik. 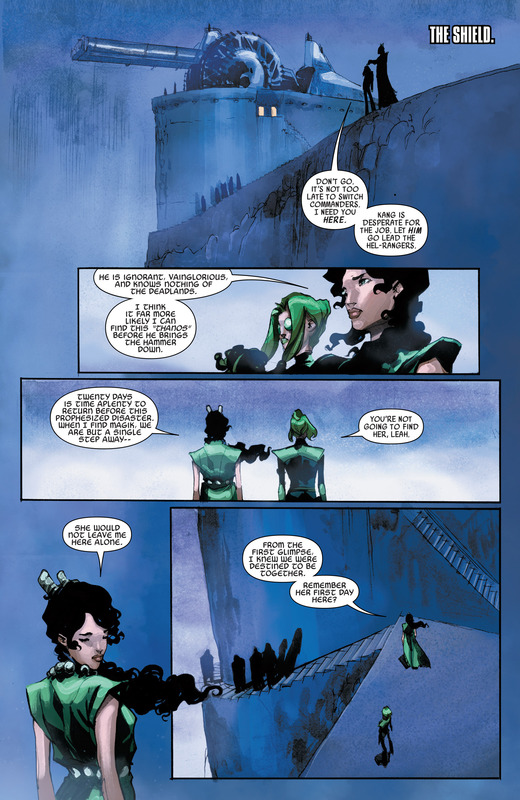 Would have also been good to have a reunion moment with Storm and Kate. 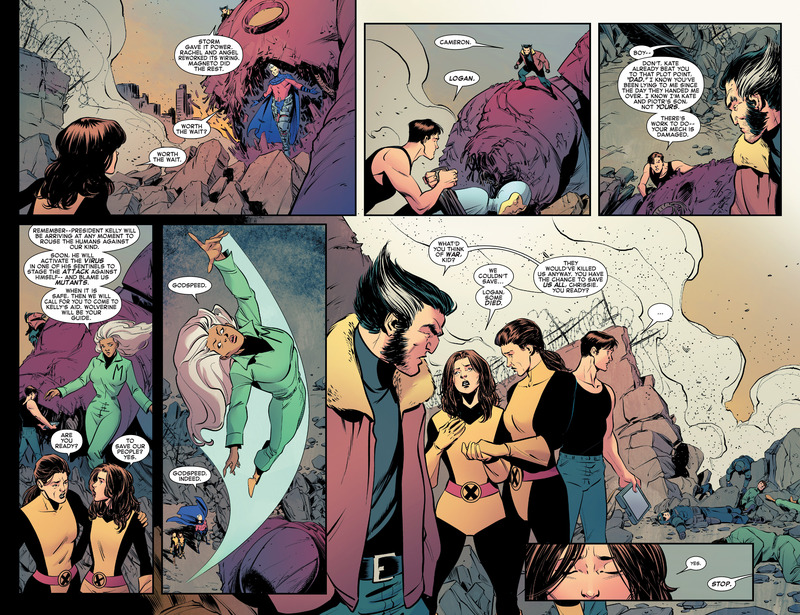 Wolverine checks in with Christina, who si pretty shaken with all of the death. Cameron, proving he has his mother’s brain – notices the computer screen. 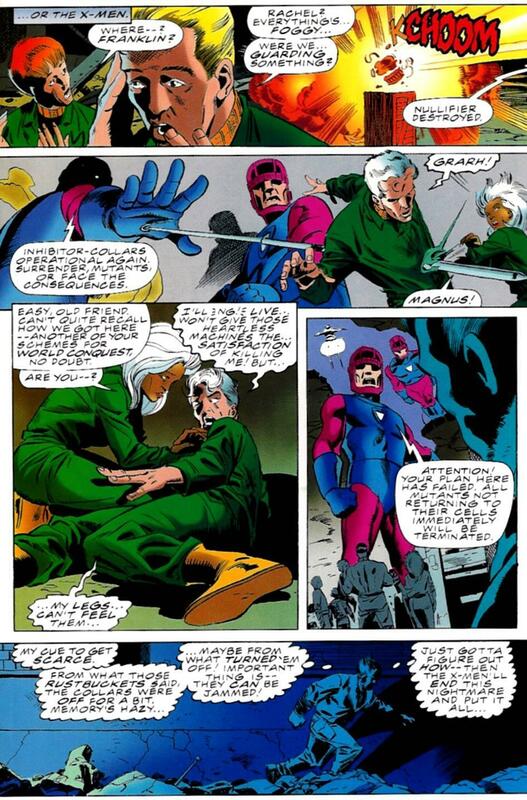 He figures out that Kelly was going to fake an attack on himself but Magneto was going to turn it into a real attack. 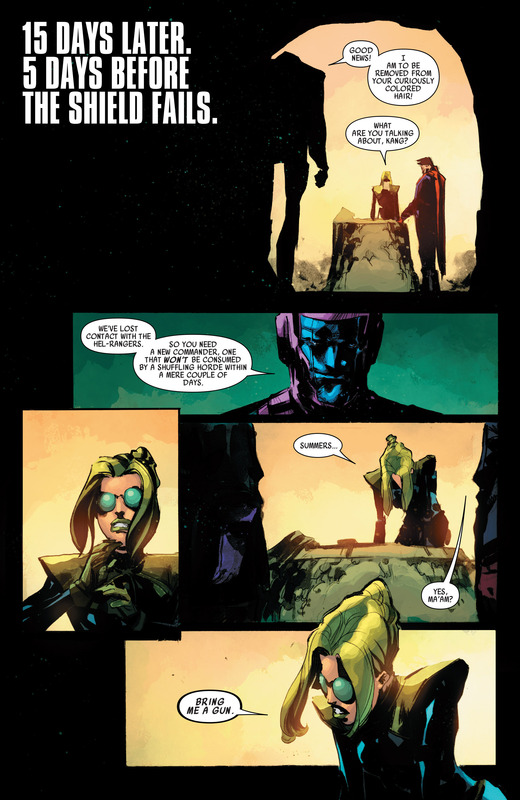 Magneto was also going to sacrifice Pryde’s Pride. 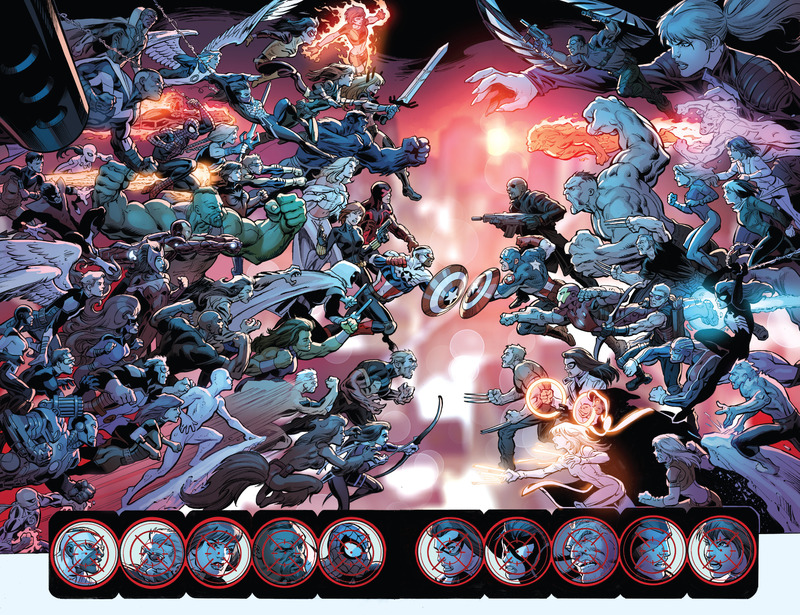 There is an ad for Secret Wars 2015 7, and at this point, I only still own the first issue. Which is one better than I thought, I would. Kate is upset, as she naturally signed on for the death of her children. 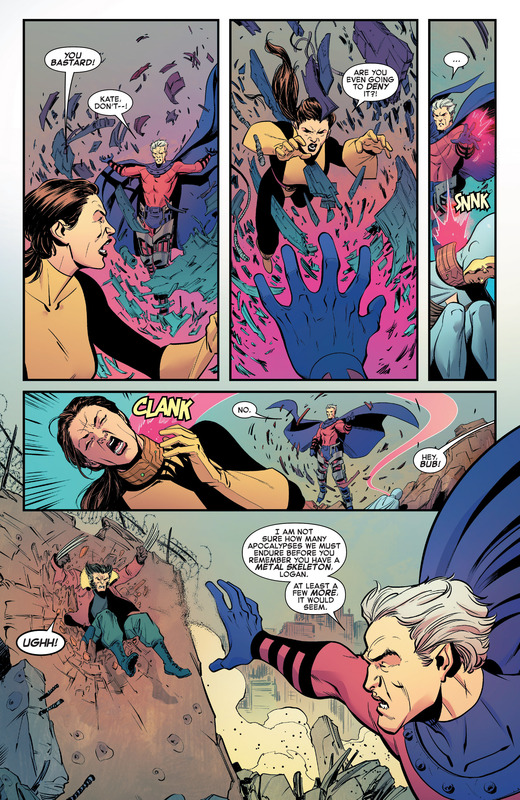 Magneto, to shut her down, steals Destiny’s collar dampener and places it around Kate’s throat. There is also a great moment when Magneto shuts down Wolverine. Which he should just always be doing. 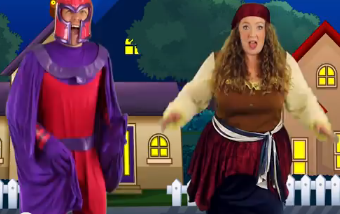 Magneto comes at Christina, like a predator. She has to die for the cause, which is pretty messed up – as he points out that he raised her for this purpose. Also twisted is that Rachel was down with the plan. Kate tells her son to give chase. Cameron kills both Pyro and Magneto in this issue, that’s quite the kill list. Christina and Cameron start having an intellectual conversation, but it leads to fisticuffs. Cameron wants the mutant race to end, as clearly nature is trying to undo this evolutionary hiccup. 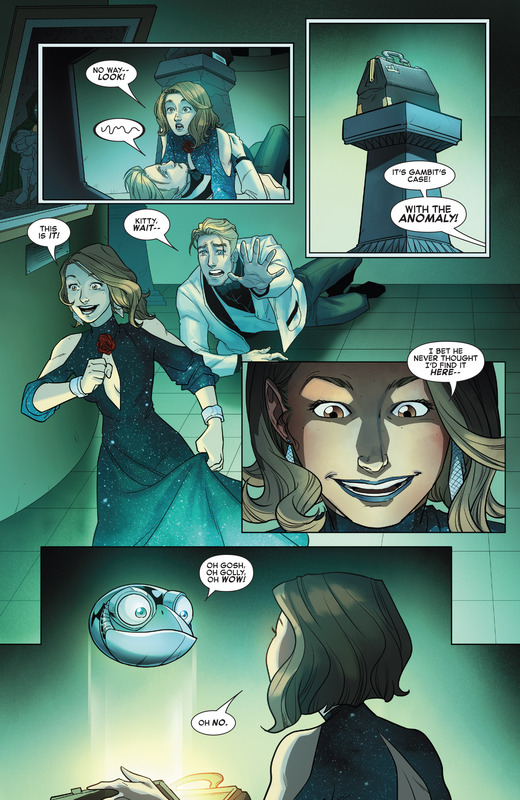 Issue ends with Christina, ready to attack her brother. 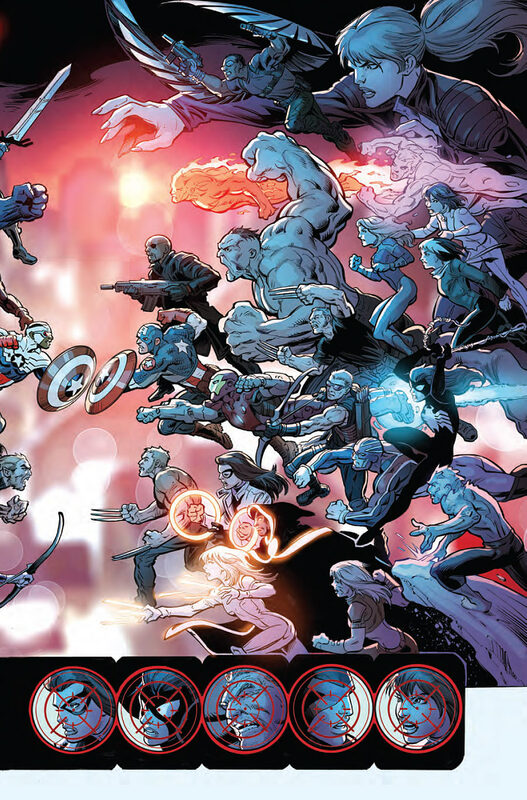 I can’t wait to find out how this concludes, if the next issue is even the final issue. 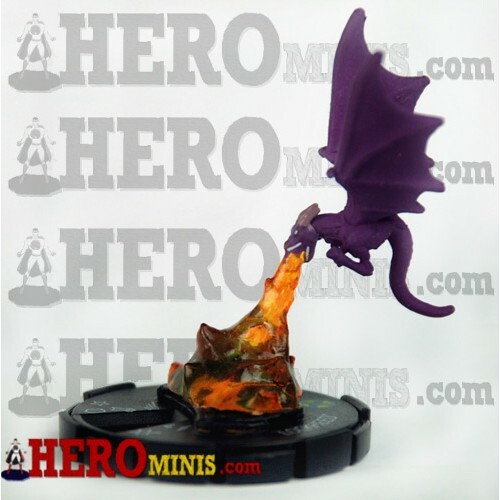 I had to add the Annie Wu Variant to my Wishlist. Pizza My Heart. Best Slice in the Manhattan Domain. 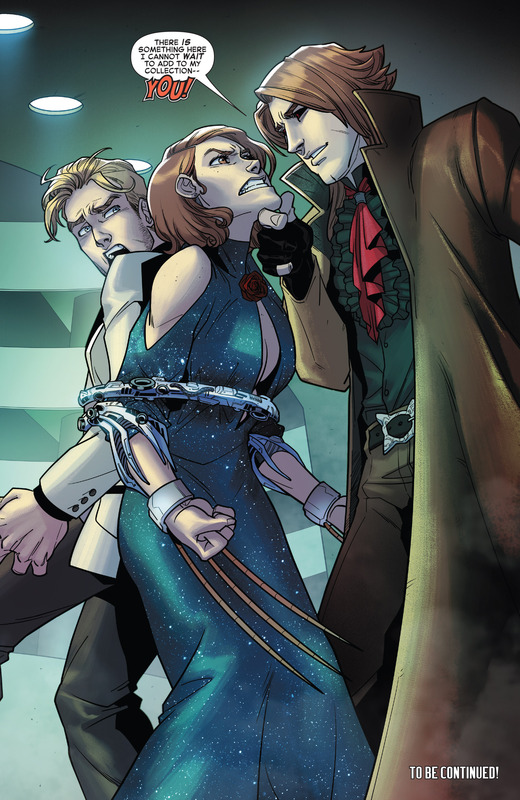 Shadowcat has Quill handcuffed to her arm. We get our first glimpse of . . . The Mutdroids! The Mutdroids are awesome! 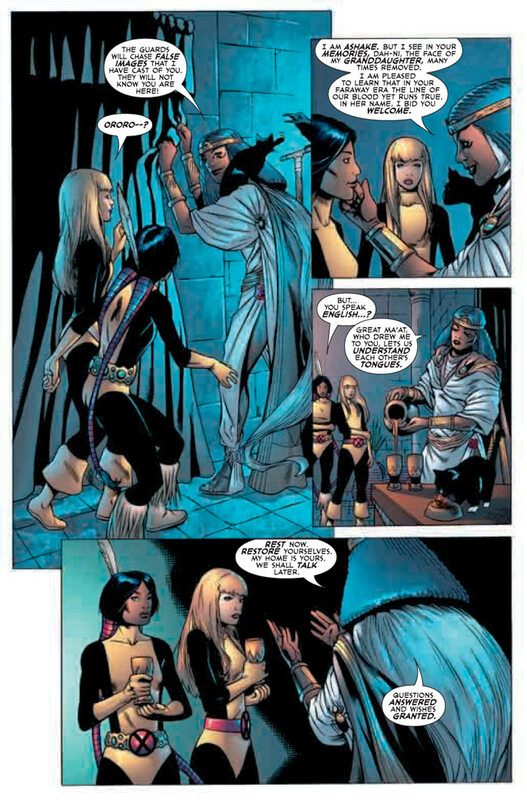 These are robotic New Mutants – Cannonball, Dani Moonstar, Warlock, Magik and Sunspot. Shadowcat is not intimidated by these foes. 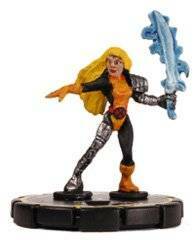 She slices Sunspot’s knees, which is awesome. 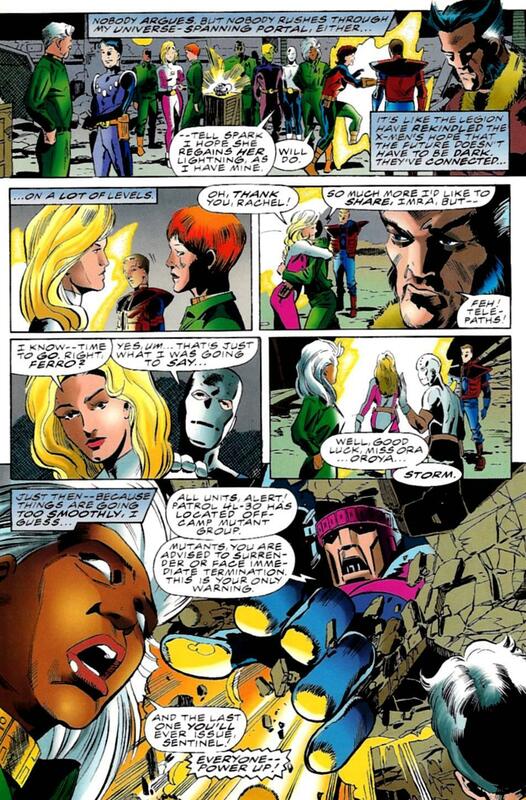 Quill is trying to understand why Shadowcat is working for Doom. This Shadowcat is intense! Cannonball comes . 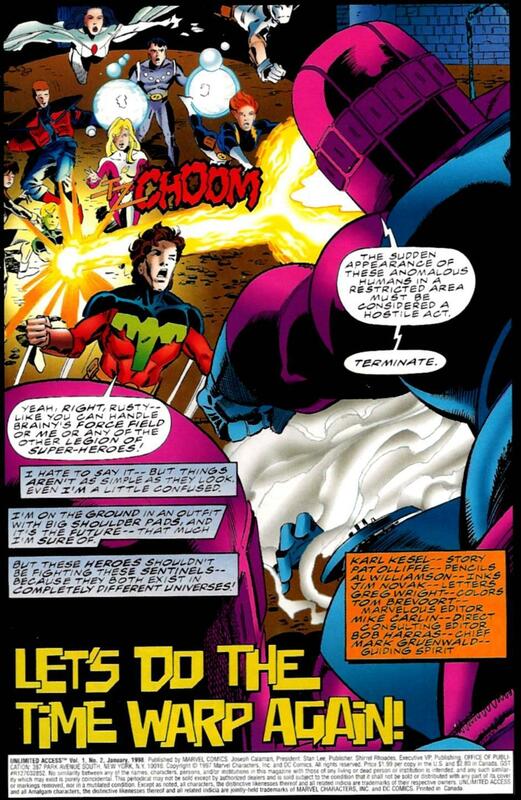 . . cannonbaling towards the non-couple, and Shadowcat opens the microwave and melts the young man from Kentucky. 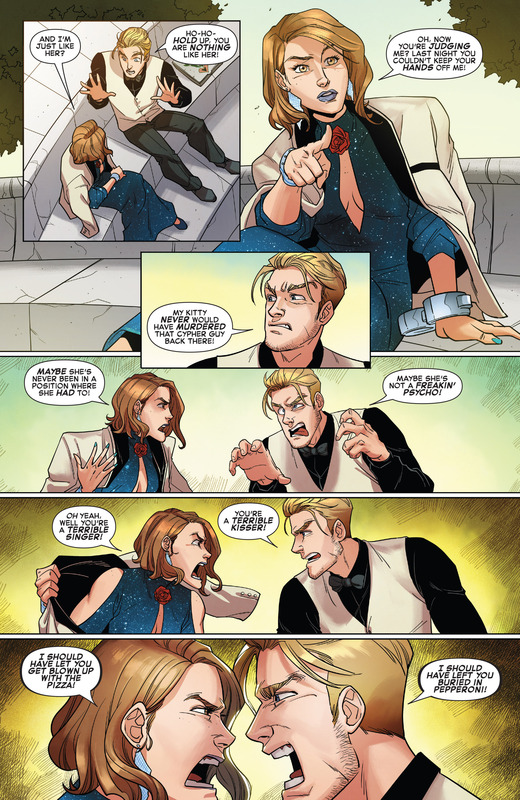 Quill is trying to explain to Shadowcat that Battleworld is a fake, he is from the previous world, and knows that Doom has masterminded this world’s creation. 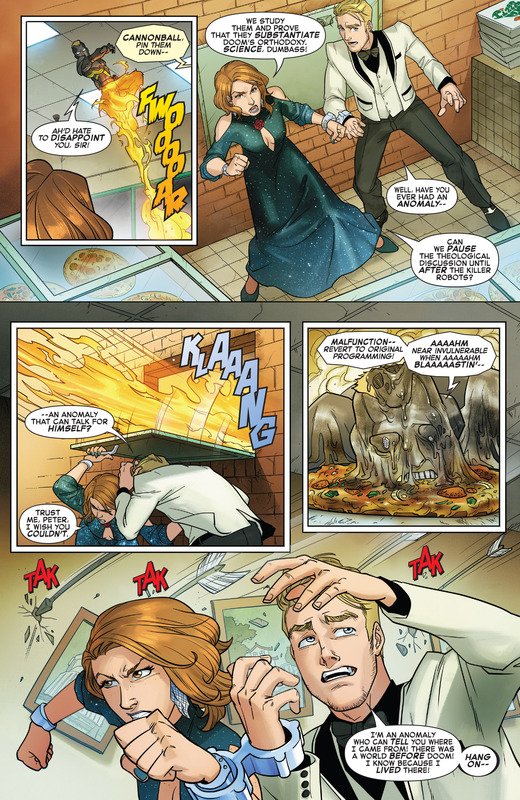 Quill gets in the fight, flinging pizzas around the place. 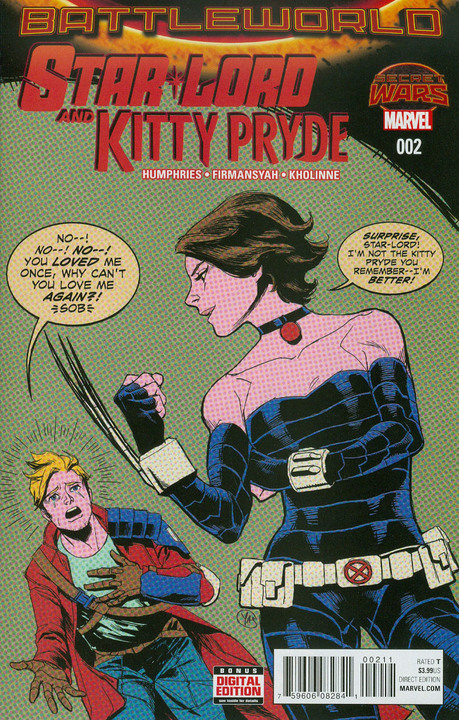 Shadowcat phase punches Dani to her dumb robotic face. So fun having Dani say “malfunction..the focused totality of my psyyyychic powwwwwers” even though that isn’t the thing she says – that would be Psylocke but I love that silly expression. 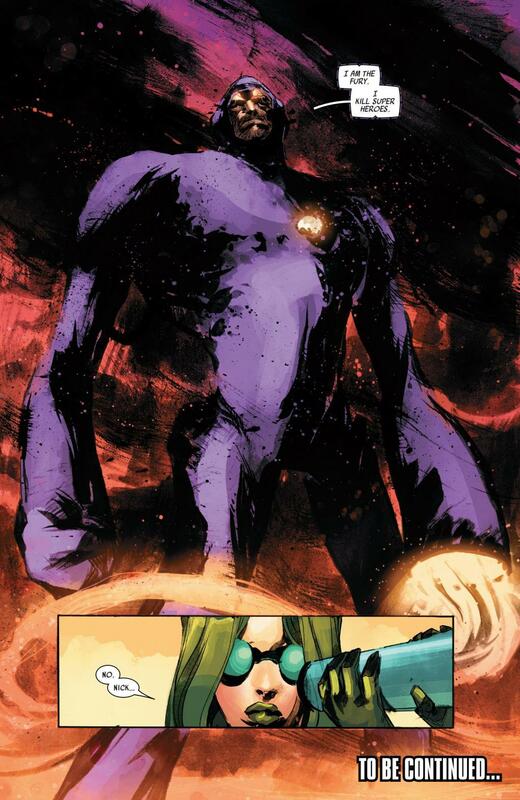 We get a slight tease of a Shadowcat v Magik fight but it is over, off panel. 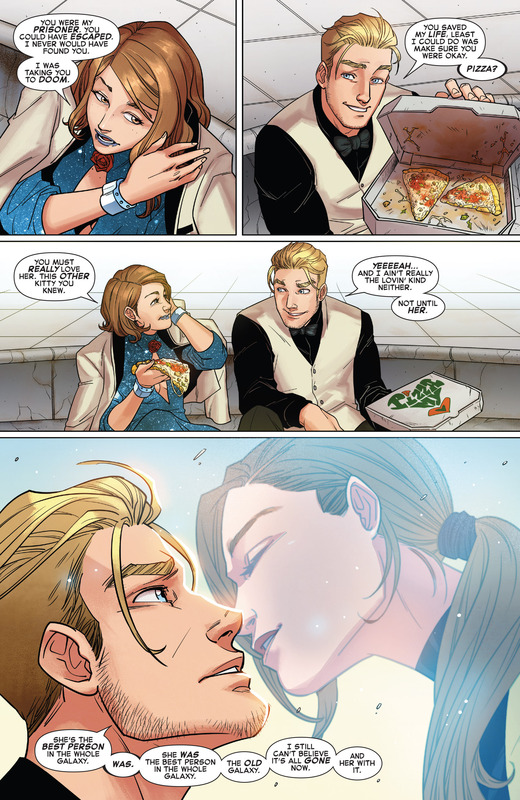 Quill takes the time to see the similarities between this Shadowcat and his fiance, Kitty Pryde. He can’t help falling in love, though she frightens him. 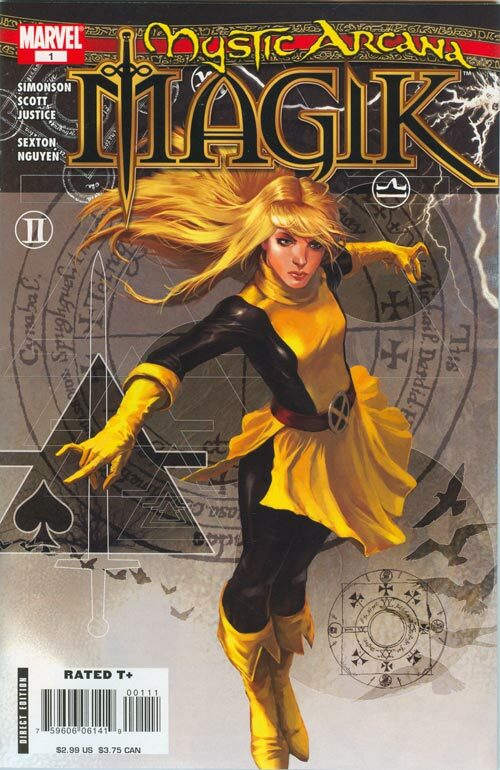 We do see that Shadowcat has pushed her claws through the bottom of Magik’s head and straight through her eyeballs. Warlock shows up, upset that all of his friends are dead. 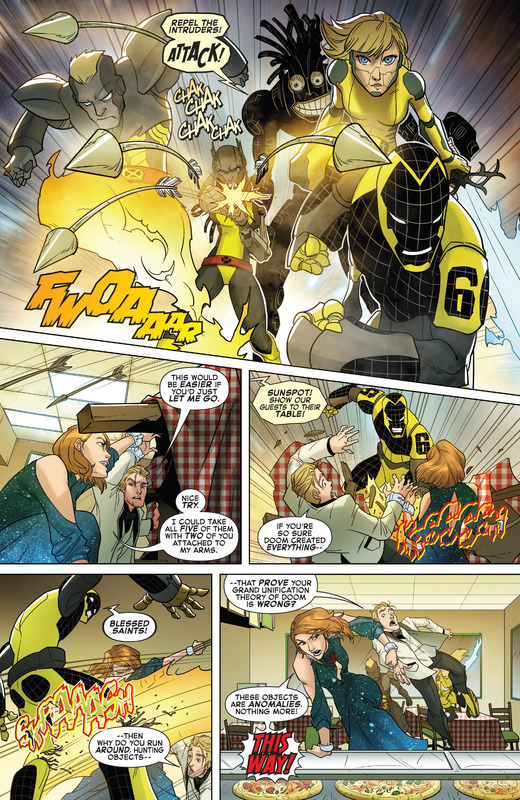 Shadowcat notices that he is speaking with nouns, so she shreds into him. Doug was using Warlock like a suit of armor. 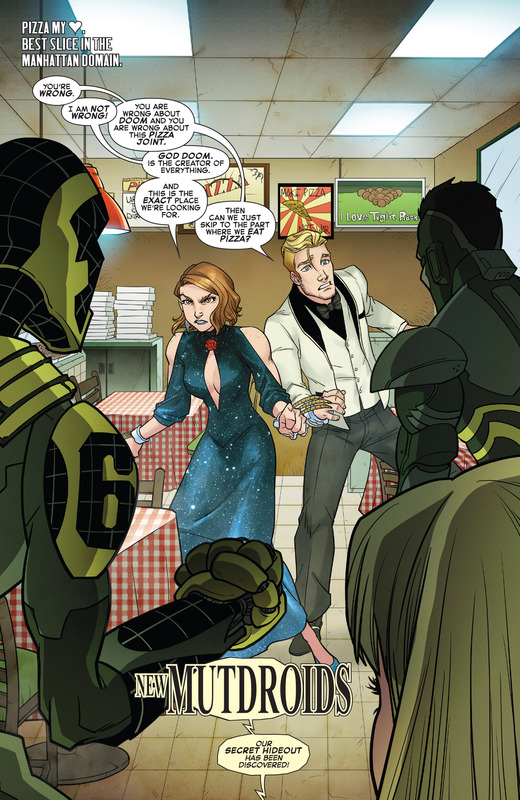 She forces him to reveal where Gambit is. He tells her Gambit is at the museum. 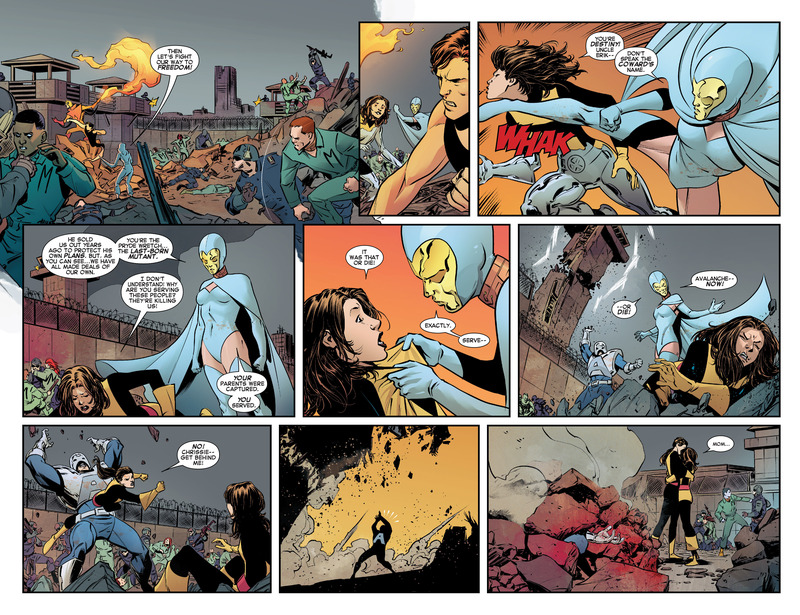 Shadowcat and Quill start walking away when Doug makes the fatal mistake of recognizing Shadowcat. She can’t let him live, and snikts him through the chest. Warlock is sad and self-destructs. Selfgoodbye. The Union of Doom Square. Later. Shadowcat wakes up, to discover that Quill has undone his handcuff. She is impress that he didn’t run off. She saved him, so he felt obligated to stick around. Since the stakes are low, they take the time to chat. 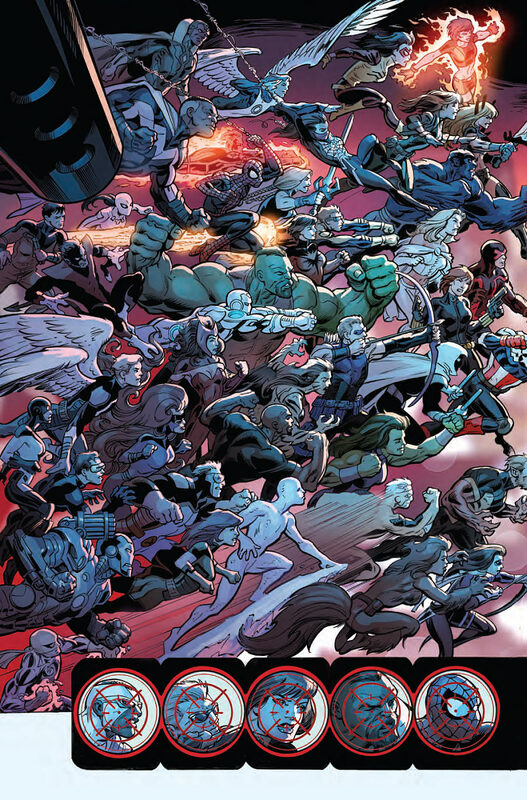 This issue can be broken down into three parts, the first opening battle. This nice scene in the Square and the final one, but I really adore all three of them. This is such a great issue. Shadowcat asks about her counterpart, Quill really loves her. The coloring in this issue, is outstanding. Kholinne makes the issue look light hearted and fun. 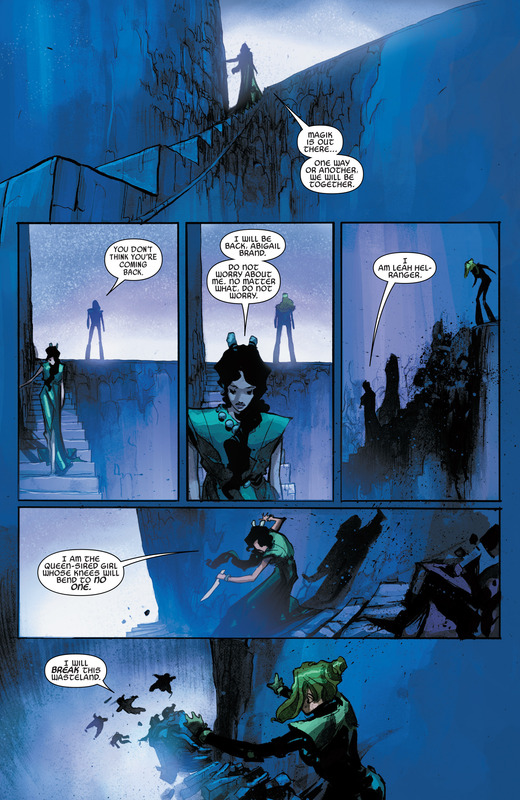 Shadowcat asks if the two ladies are the same, and Quill is far to quick to say that they are nothing alike. This, naturally, offends her. I can’t believe we got an issue where Kitty Pryde killed both Magik and Doug Ramsey! At least there wasn’t a scene where she strangled Lockheed! They get heated, which is also fun to see. She’s a freakin’ psycho. He’s a lousy singer and she isn’t good at kissing. I like the very real quiet beat there, for the top panel. The two let the moment rest, probably replaying the previous minutes, in their heads. Quill needs to have the situation explained to him. Kitty can’t request backup, as she is on a renegade mission. Doom has two hands – one hand with Science, the other, Law. The two often collide. 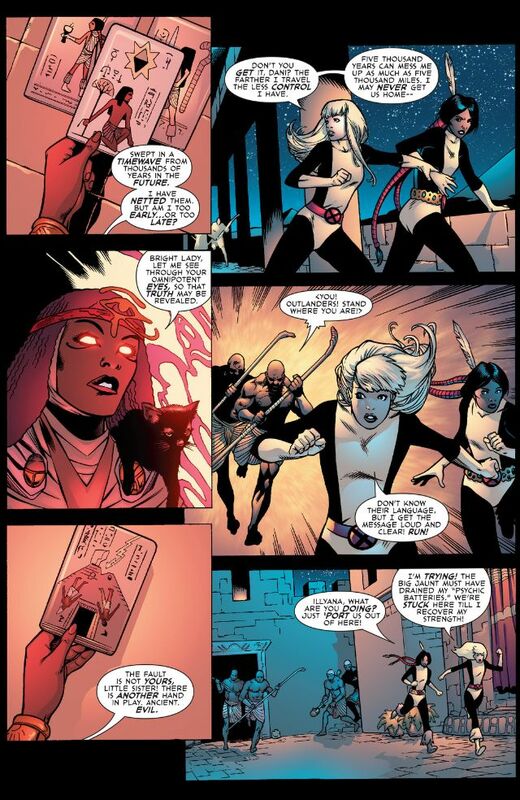 Shadowcat confirms that she is from the Kingdom of Apocalypse, so now we know that she is the AoA Shadowcat – or some version of that one. If she didn’t go work for Doom, everyone in the region would be killed. 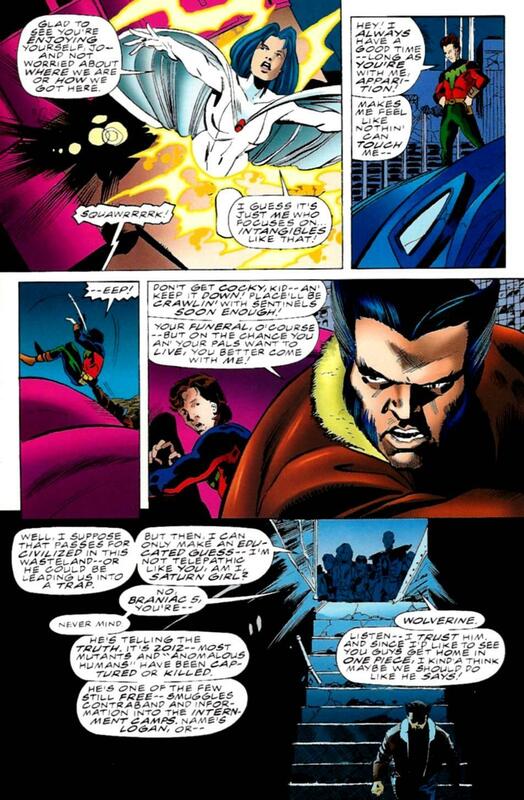 Shadowcat allows Quill to walk away but he is committed to follow this through. This doesn’t thrill her, at all. The Doomenheim Museum. Quill isn’t impressed that Doom made himself a museum. 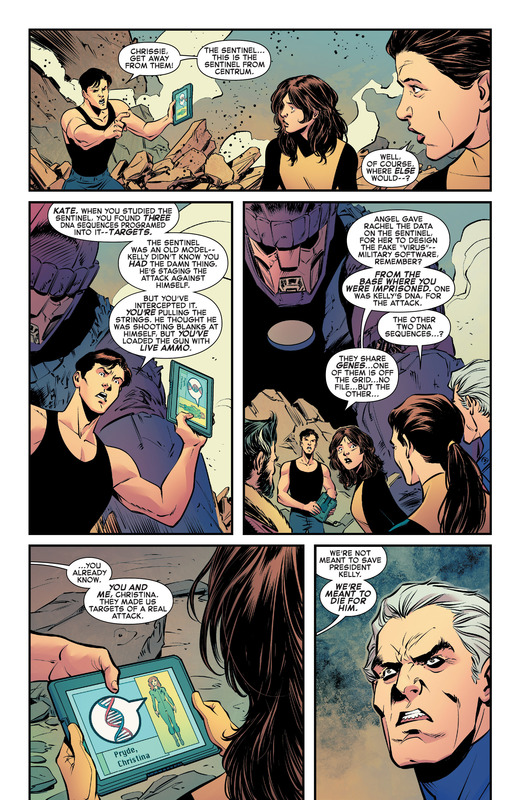 Shadowcat has to explain that Doom had nothing to do with it, Doom doesn’t care about any of this nonsense. She phases the two of them through the ceiling, which the falls excites Quill. 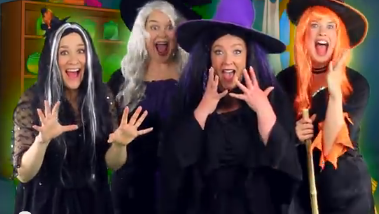 Who lets out a giant scream, when they are on a covert mission? They fall to the ground, she falls on top of him and they look like they are about to kiss. 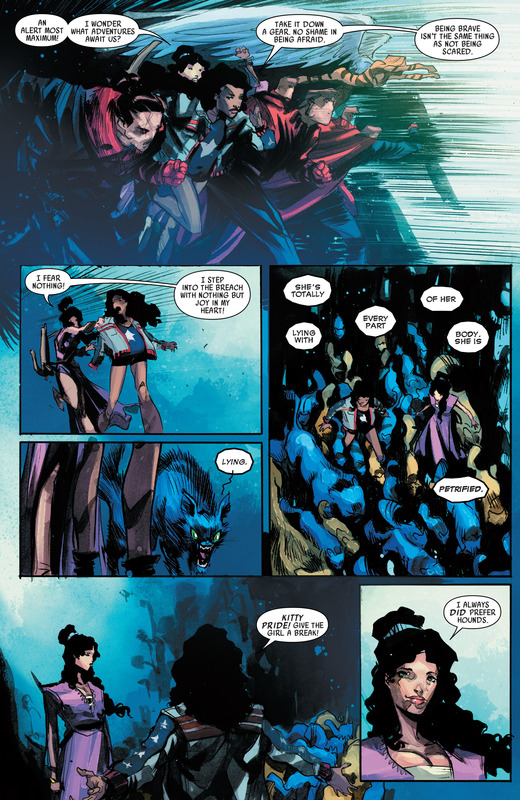 Shadowcat pulls away, as she sees Gambit’s bag, with the lock of hair in it. She opens the bag to reveal . . . WIDGET!!! That’s right, ya’ll, Humphries straight up brought Widget back! So awesome! 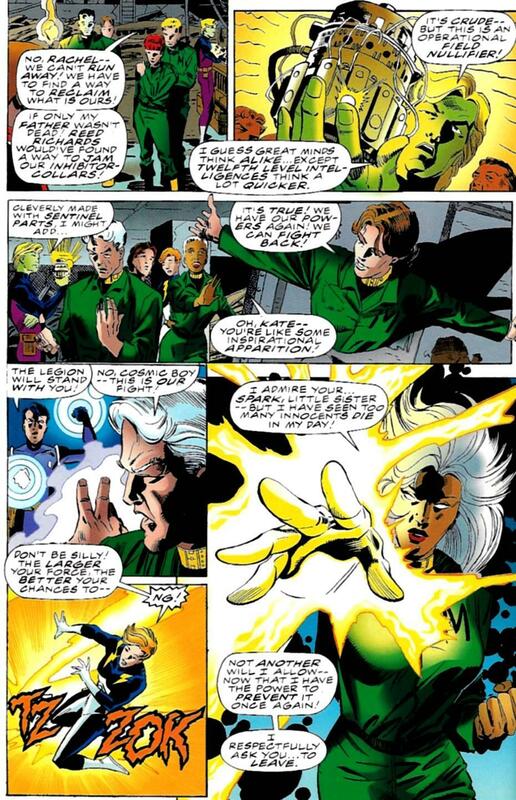 Widget is able to cancel Shadowcat’s powers, which informs her that Widget is an alternate version of herself. Quill doesn’t know how to make of this. Gambit, who I haven’t enjoyed this much – in years – waltzes in. 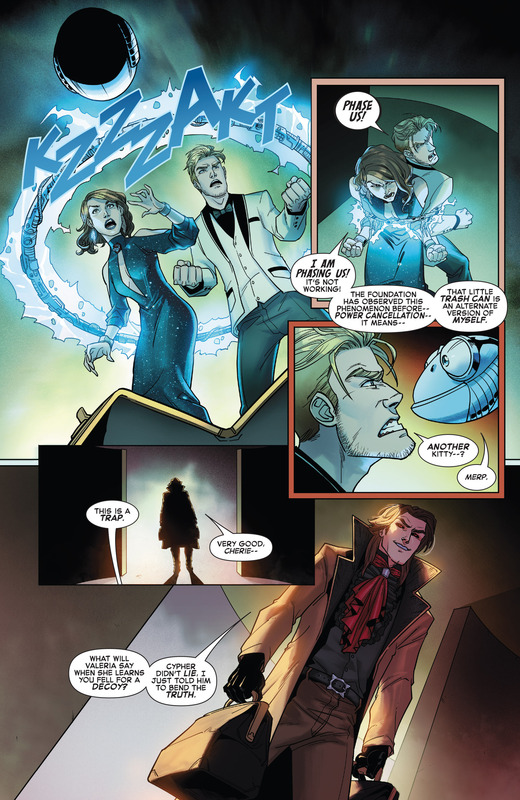 Issue ends with Gambit revealing that he wants to add Shadowcat to his own collection. So creepy! but understandable – still creepy! Such a great series! 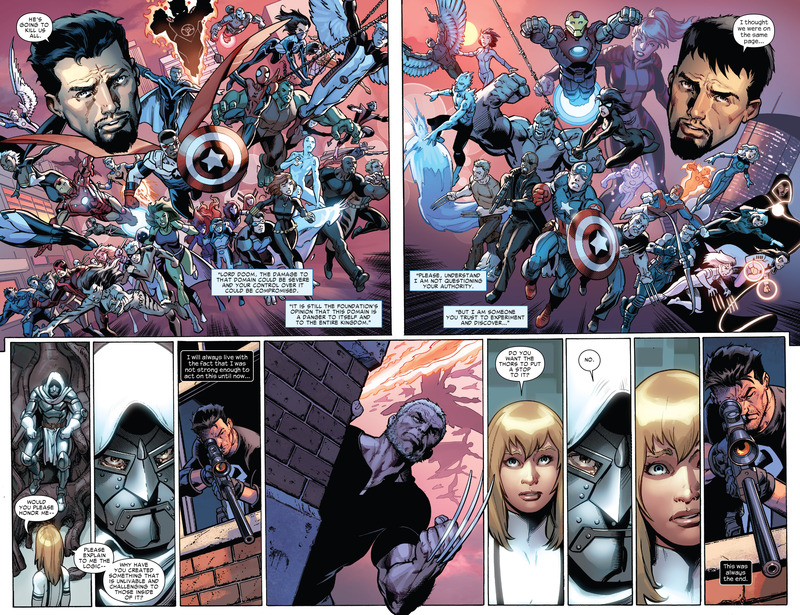 By far, the best series to come out of Secret Wars 2015 – including the mains series, itself. 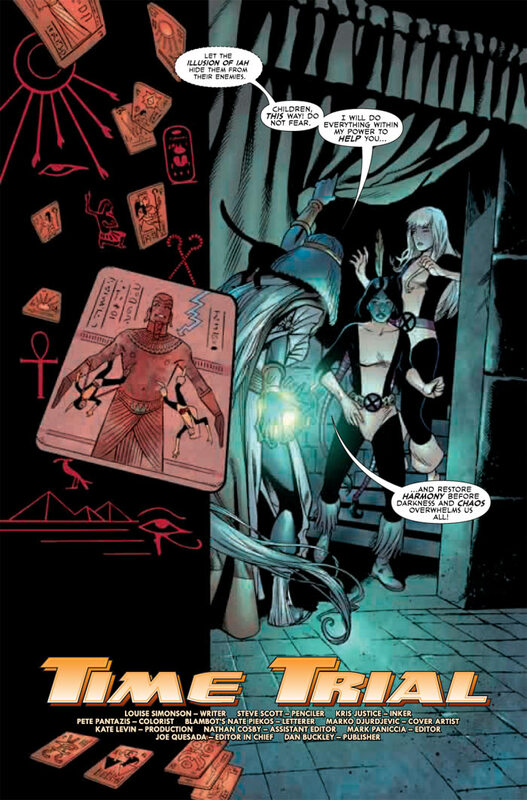 UncannyXMen.net has this great series of, Secrets of the X-Men, feature. 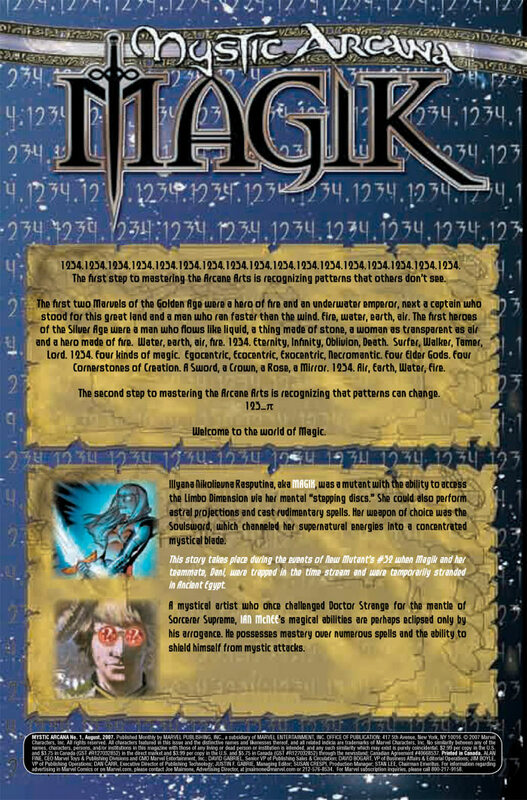 There are several Wizard issues that are referenced. So I rescued this issue from my For Sell list from Lonestar Comics. Other issues that are on my Wishlist are – 90, 159 and 219. My collection has several before and after 90, so I am not sure where issue 90 is. I own the Elektra / Jennifer Garner cover instead of the Cassaday Astonishing X-Men cover for 159, so on the For Sell pile it stays. The Chris Claremont interview is on pages 46 – 50. 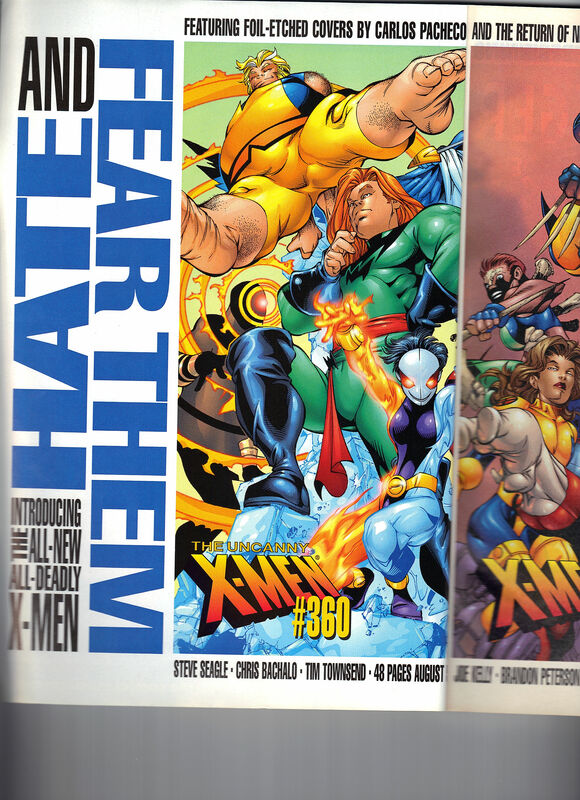 In it, there is a sidebar where Claremont wanted Kitty Pryde for his terrific Fantastic Four run. The X-Office turn down his request. 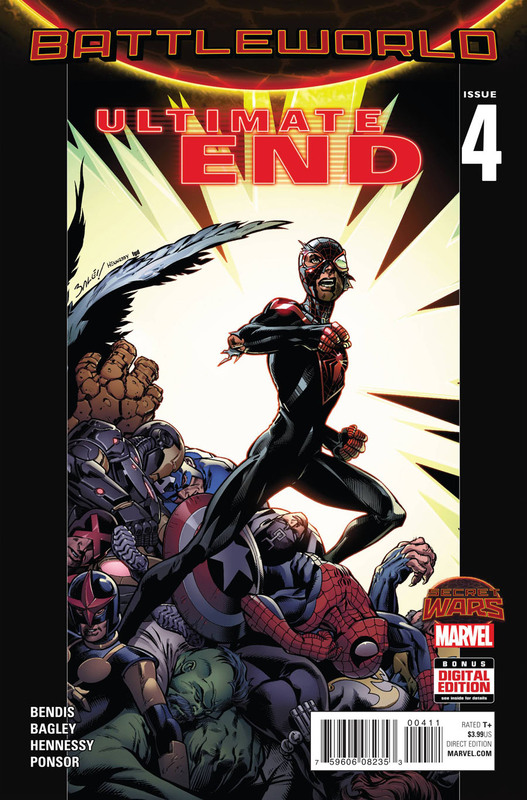 The entire interview is about his Fantastic Four run, that is just starting, along with his short Wolverine run. 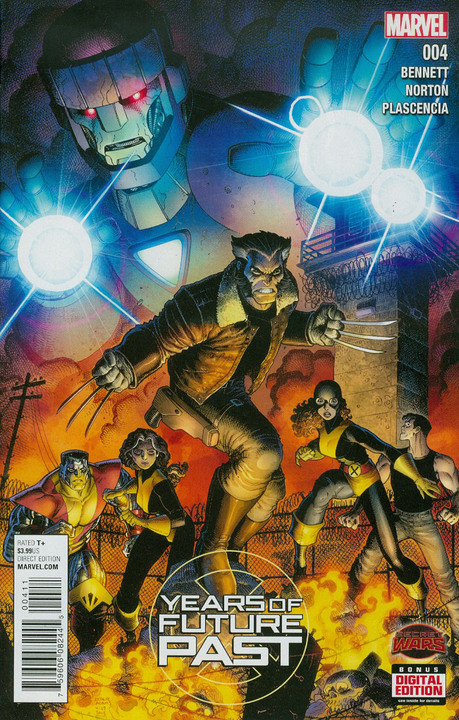 The run that marries Wolverine and Viper, that we will review here one of these Novembers. 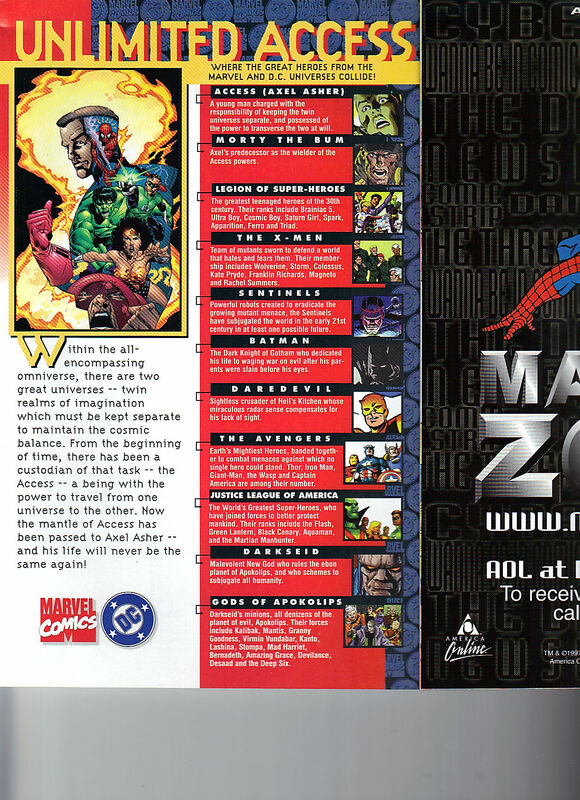 The first five pages are ads for Marvel that I really wanted to own when I was at San Diego Comic Con that year. 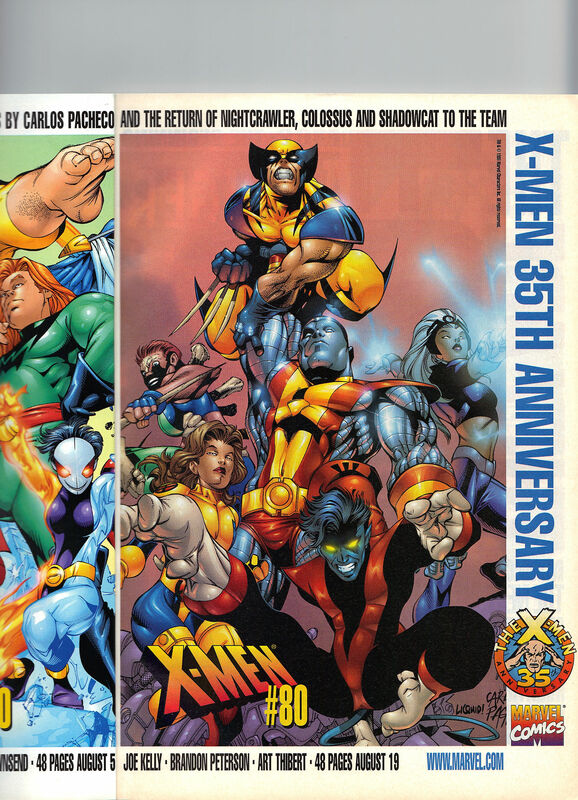 These were celebrating the X-Men 35th Anniversary issues. 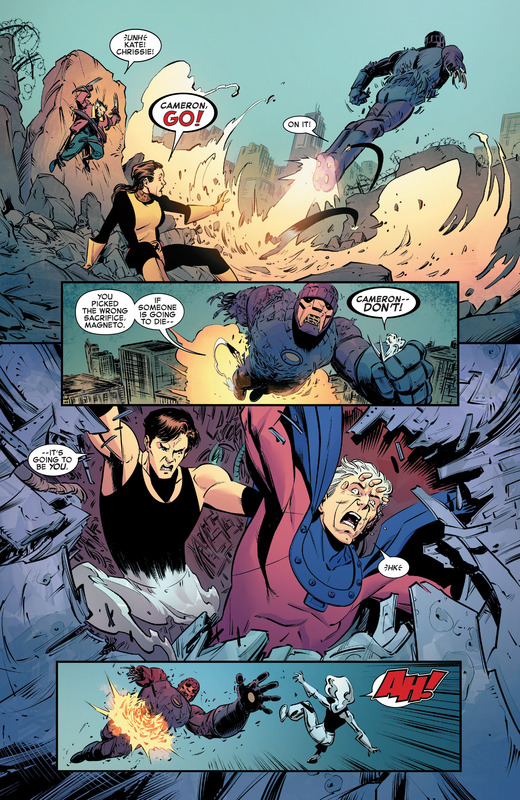 Uncanny X-Men 360 and X-Men 80. MC2 is just about to start. 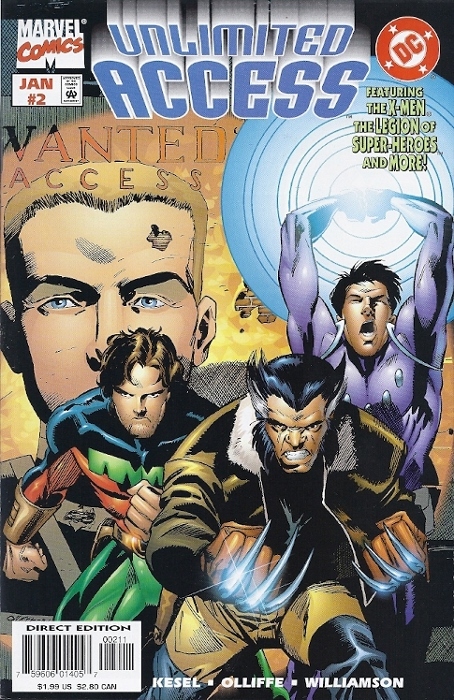 As is Mutant X and yet another Blade miniseries. 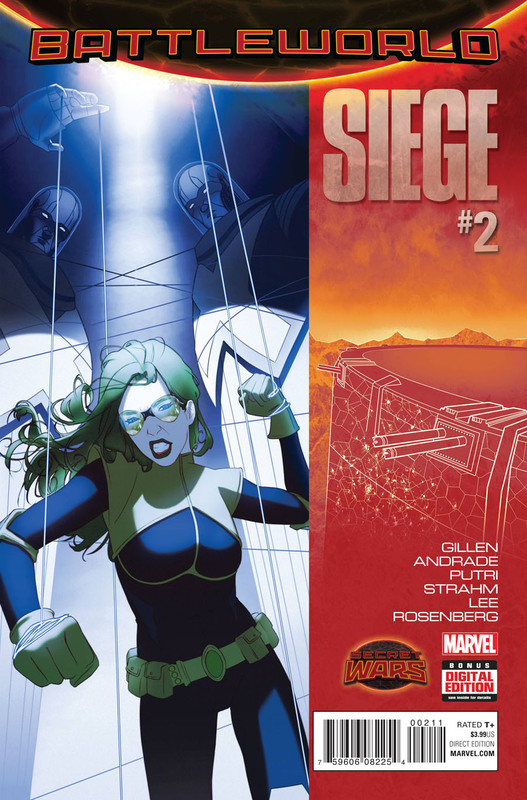 Along with a checklist for all of Marvel’s August comics. I harassed the Marvel stage guy for a little bit, trying to take these two cardboard posters home with me. I’m sure they were thrown away soon after the convention. 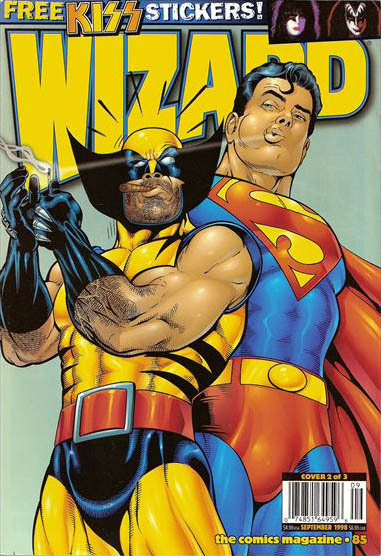 Wolverine and Superman cover is by Kevin Maguire, and they are promoting the Top 25 Moments in Comics. 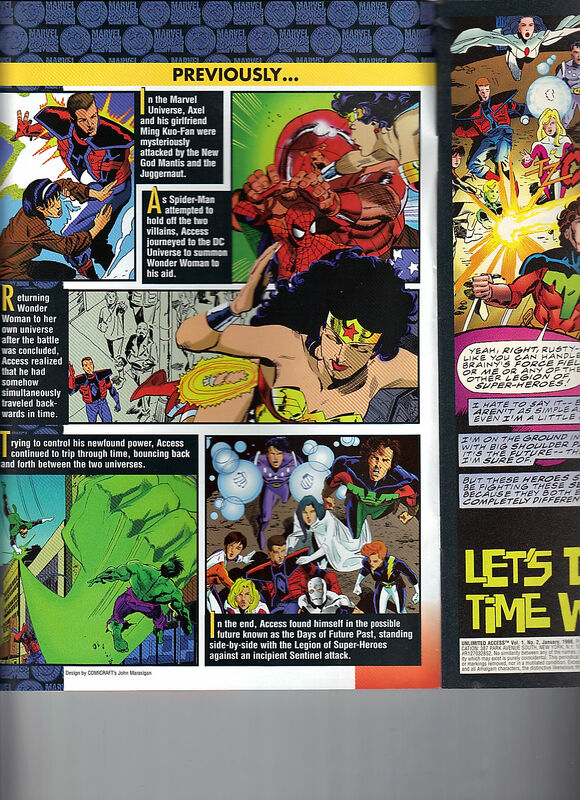 There are several DC Comics’ ads promoting how they are the Original Comic Universe. I love how much this is a time capsule of what was happening at the time. Beastie Boys’ Hello Nasty came out. Halloween H2O came out, it is only okay. Though it will turn out to be the last good one in the franchise. Only Punisher is not good. Dark City is on DVD now. There is another poll asking if we would buy a second Green Lantern title and if we would support a Hal book and a separate Kyle book. 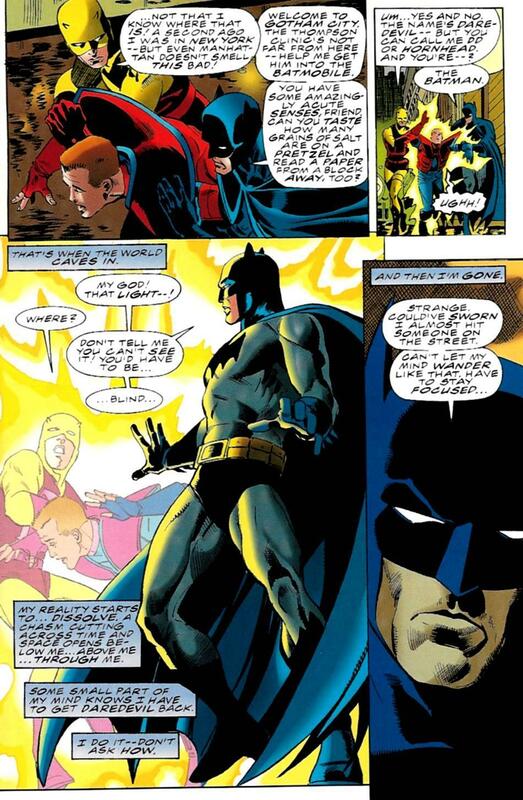 Oh, how I have forgotten the Hal v Kyle debate. Kyle, for me. October will be Deadpool month, which was awesome. Joe Kelly’s run, go buy it! 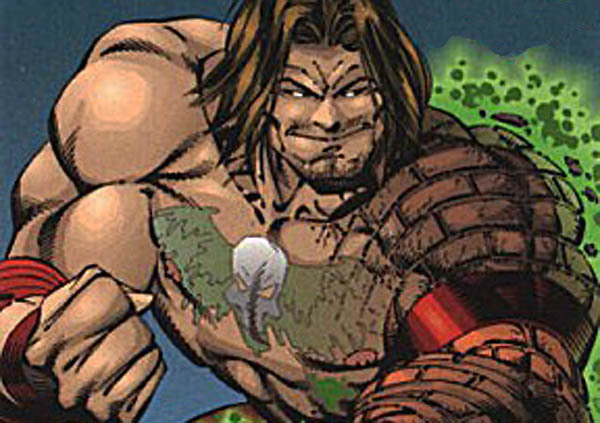 Rumor that Gambit will join the 35th Anniversary team. He does. Vampirella is getting a revamp, mostly getting a full body armor. Which I can only imagine that putting clothes on her is the go-to idea to revamp her. I am sure that it is never successful. Battle Chasers is hitting big. I really liked it. 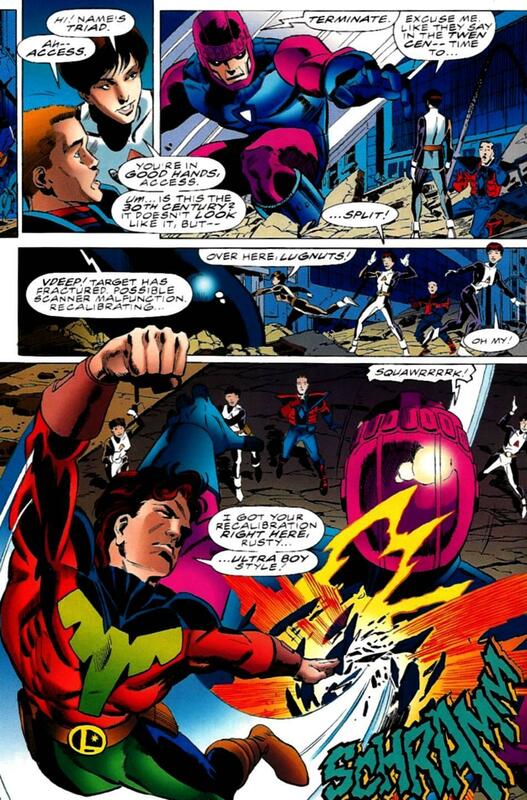 Generation X 40, the infamous issue that explains the complicated Penance and Monet origins. It is not very good. 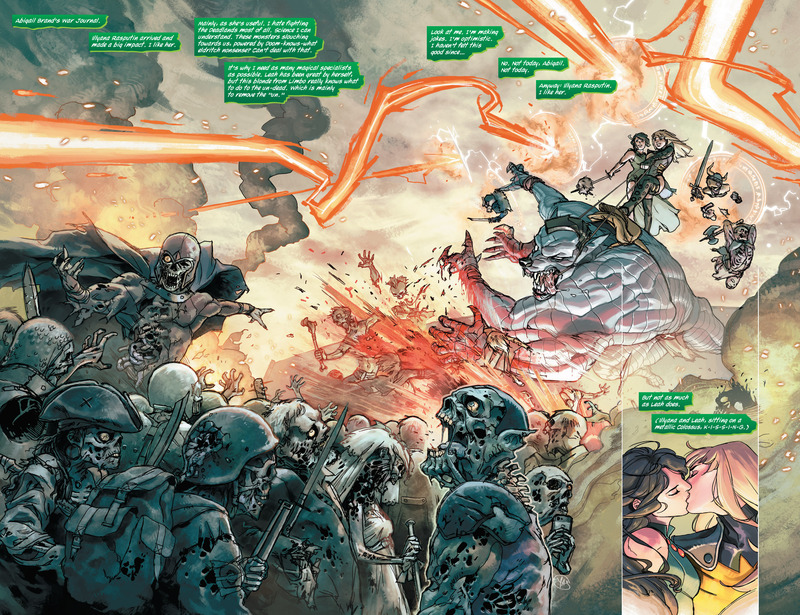 Last Man Standing – Superman v Spawn. Superman wins. Drawn by Barry Kitson. Joe Casey interview on pages 38 – 44, I wonder if Chad Nevett knows about this. I just love Casey’s Cable run – which the interview covers. Danger Girl gets the Casting Call treatment. This and Battle Chasers, I was a huge fan of. I didn’t get the vampire title Cliffhanger released. Who is Gena Lee Nolan? 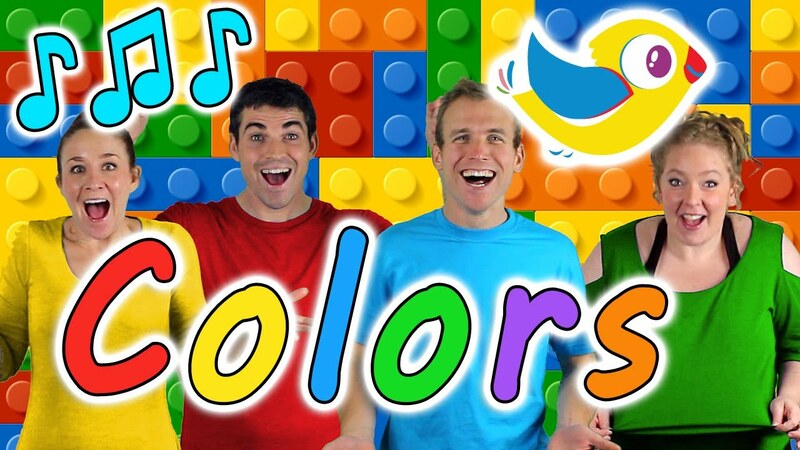 Coming Attractions, oh boy, this brought me back. FOX had the Captain America and Avengers movie rights. Batman the Animated Series is entering its final season. Marvel is still in bankruptcy at this point. Dilbert, the cartoon, is coming to UPN. Doctor Katz is entering its fifth season. King of the Hill is starting its third season. Men in Black, the cartoon, is starting its second season. Micronauts is slated for a movie on the SciFi channel – it never came out. Nor the cartoon series. Simpsons are starting their tenth season. South Park starting its second season. Spawn is also starting its second season. Tom Cruise is working on an Iron Man treatment for FOX. Bryan Singer is getting close to finalizing an X-Men film. 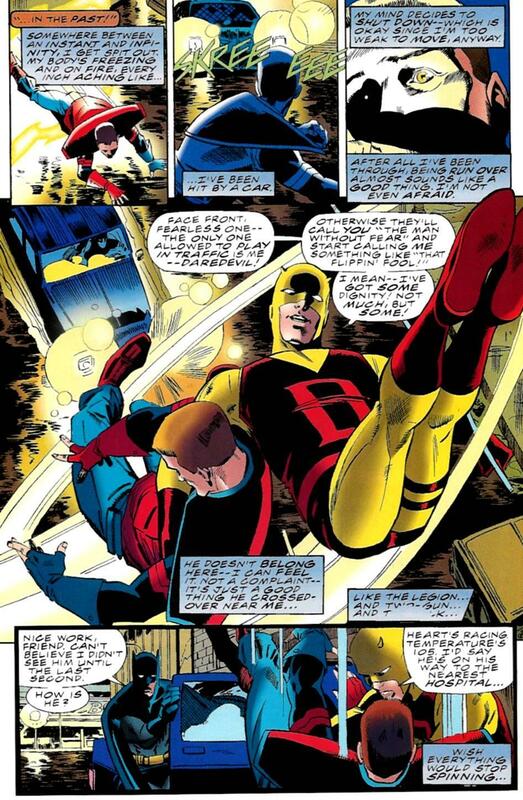 Matt Damon is rumored to be Daredevil, which I would have preferred. Batman / Superman Adventures won a Daytime Emmy for World’s Finest. Fantastic Four 1/2 is being offered. X-Men fighting game coming to PlayStation One. Tomb Raider film is coming, no actress has been chosen yet. 10. Christina Z / John Romita Jr.
I’m pretty sure none of those pairings have happened.